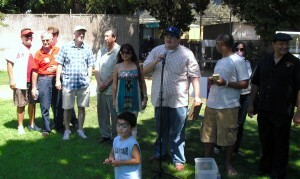 My son Jacob and I visited the Orange County Labor Federation’s special Labor Day celebration at the Santa Ana Zoo today. They had a great turnout – and a lot of fun for the families in attendance. There was a jumper and a sport-themed inflatable attraction; cotton candy, snow cones (raspados! ), hot dogs, soda and chips, and plenty of games.